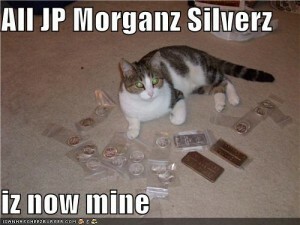 JP Morgan is the largest silver short-seller in the history of the world. JP Morgan is the “custodian” for the largest “long” silver fund in the history of the world, making this one of the largest conflicts of interest in all of history. If the unit-holders of the iShares Silver Trust (or “SLV”) make a small amount of profit on their holdings (per unit), JP Morgan suffers massive losses on its “short” position in the futures market – and then at least one hundred times that amount of additional losses on its unimaginably huge, leveraged, silver derivatives. We know this thanks to the loquacious banker, Jeffrey Christian, formerly of Goldman Sachs and now head of the CPM Group, one of two “consultancies” who are quasi-official record-keepers for the gold and silver markets. Obviously JP Morgan has a gigantic personal incentive to try to make sure that holders of SLV units make as little as possible on their investment.